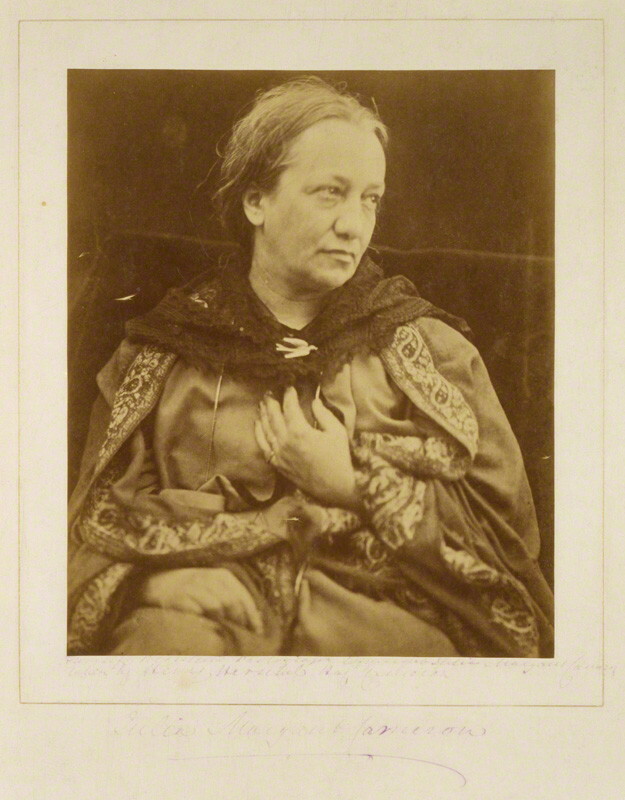 Henry Herschel Hay Cameron (later The Cameron Studio), Julia Margaret Cameron, 1873. Albumen print, 24.4 x 20.3 cm. Source: National Portrait Gallery. 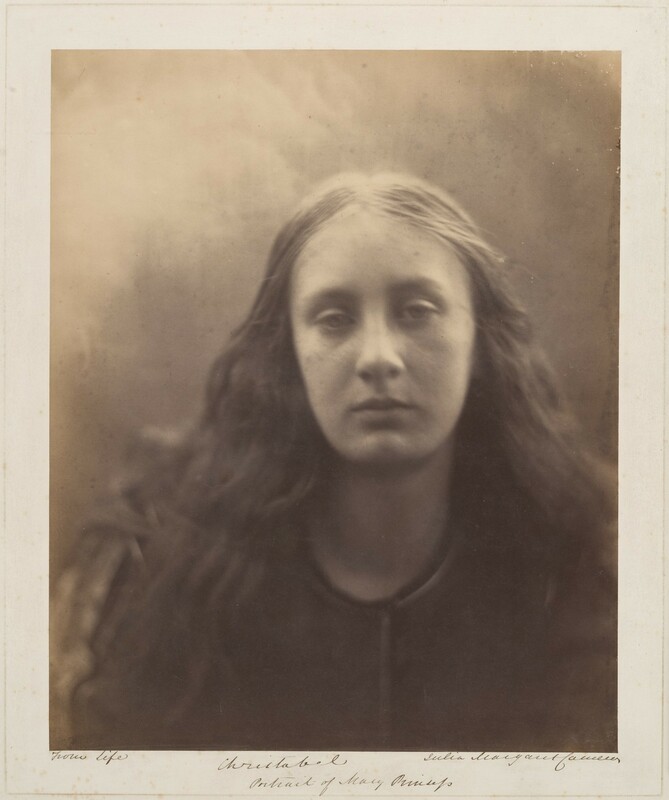 This year marks the bicentenary of the birth of Julia Margaret Cameron, the pioneer Victorian photographer whose work has rightly been praised by scholars and the public alike. Indeed, the V&A will honour the occasion with a large exhibition of 100 of her photographs this November, while Will Gompertz recently made a case for her as the face of the new £20 note. Previous shows include the 2003 retrospective at the National Portrait Gallery, her inclusion in The Pre-Raphaelite Lens: British Photography and Painting in 2010, and a display at the Metropolitan Museum of Art in 2013. I forget how or when I discovered her photographs but they’ve been a passion of mine for several years, making her my favourite photographer. It’s appropriate, then, to write this for the 11th June, on which day in 1815 she was born – although even a quick glance at her work, much of it still breathtaking and timeless in its immediacy, makes that difficult to believe. Rather than attempting to encapsulate her entire oeuvre in a humble blog post, I will highlight five of my favourite images by this brilliant, innovative photographer. 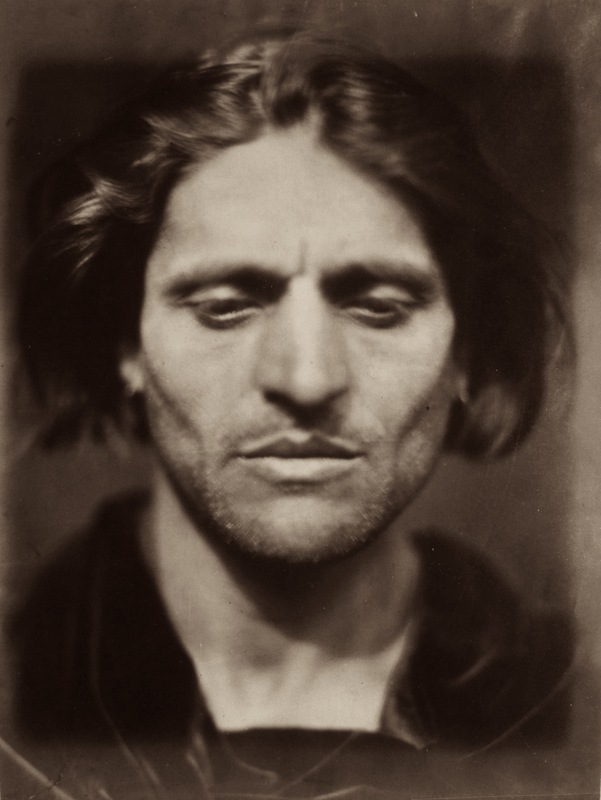 Julia Margaret Cameron, Iago, Study from an Italian, 1867. Albumen print, 33.4 x 24.8 cm. Source: Own photograph of the original print at the National Media Museum, Bradford. It is difficult to view Iago and not be mesmerised, even if (unlike me) you aren’t a tiny bit in love with him. The only surviving print is kept at the National Media Museum, Bradford, where I had the good fortune to spend a day last winter examining boxes of original Camerons. One of the first things that struck me was the print’s size: it’s virtually life-size, heightening the sense that you are looking into a face which might have been photographed yesterday, rather than in 1867. Cameron acquired her first camera in 1863, aged 48, as a Christmas present from her children, and after getting to grips with the lengthy, complex and even dangerous photographic process (juggling noxious chemicals and light-sensitive glass negatives) she perfected her technique and style. When she purchased a new lens in 1866 she began producing atmospheric head-and-shoulder portraits, of which Iago is a fine example. The sitter’s identity has been the subject of speculation: Colin Ford identified him as Angelo Colarossi, famously the model of Alfred Gilbert’s Eros statue at Piccadilly Circus; but convincing new evidence by Scott Thomas Buckle suggests that he is Alessandro di Marco, another professional Italian model who sat for Burne-Jones, Leighton and Watts. At any rate his chiselled, striking features are the photograph, intended to portray the villain of Shakespeare’s Othello. To my mind this is not the scheming Iago but the penitent man reflecting, perhaps years after, on all that has happened. Or perhaps he’s on the point of deciding whether to pursue or retreat from his villainous course. Are we conflicted in finding a soft, romantic beauty in a man who after all manipulated Othello into murdering his wife Desdemona? He could equally be Romeo or Hamlet, and these ambiguities are why the portrait deserves continual revisiting, his expression appearing to change according to each viewer’s mood. Another proposed theory is that it has been mis-titled, and this is actually a head of Christ as the ‘Man of Sorrows’ – though this ignores the fact that Cameron herself listed the picture as Iago, Study from an Italian in the album index. Julia Margaret Cameron, Christabel, 1866. Albumen print, 33.2 x 26.9 cm. Source: Met Museum, NY. Along with Iago, this portrait of May Prinsep posing as Christabel is probably my favourite Cameron photograph. Prinsep, positioned slightly off-centre against a misty background, gazes directly out at us with heavy-lidded eyes from a pale, oval face. The expressiveness of the image is partly due to Cameron’s innovative, deliberate use of soft focus, gently blurring the sitter’s contours and receding into a haze; she also allowed movements of the head during the long exposure. This directly opposed the stark, pin-sharp clarity and rigid postures favoured by conventional Victorian studio photographers (and most of the all-male photographic establishment). Meanwhile, the title comes from Samuel Taylor Coleridge’s unfinished poem Christabel (1816), a strange gothic ballad in which the eponymous maiden is bewitched and seduced by a mysterious enchantress, Geraldine. In an essay written for my degree, I argued that the female character presented in Cameron’s photograph is ambiguously either Christabel or Geraldine – the title could refer specifically to the former, or more generally to the poem itself. The soft focus blurs distinctions between the virginal, virtuous Christabel and the wicked enchantress Geraldine, making her at once the seduced and the seducer. This is heightened by her sultry, dreamy expression which for Sylvia Wolf connotes ‘a kind of post-coital languor’; her loose, dishevelled hair indicates a lack of decorum more suggestive of the boudoir than the drawing-room. 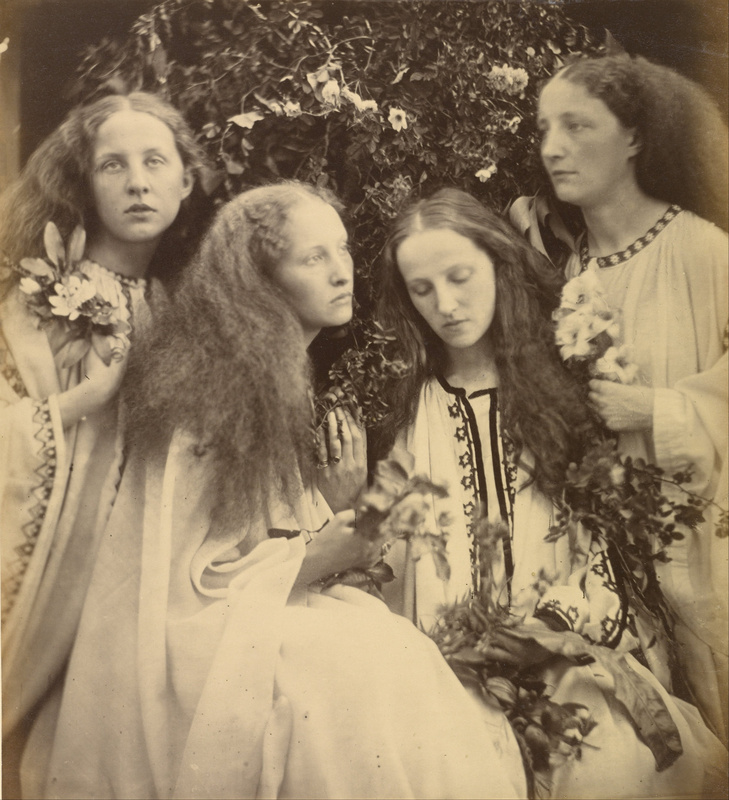 Julia Margaret Cameron, The Rosebud Garden of Girls, 1868. Albumen print, 29.4 x 26.7 cm. Source: Google Art Project via Wikimedia Commons. The sitters are, from left to right, Nelly, Christina, Mary and Ethel Fraser-Tytler – Mary was herself an artist who eventually married George Frederic Watts in 1886. 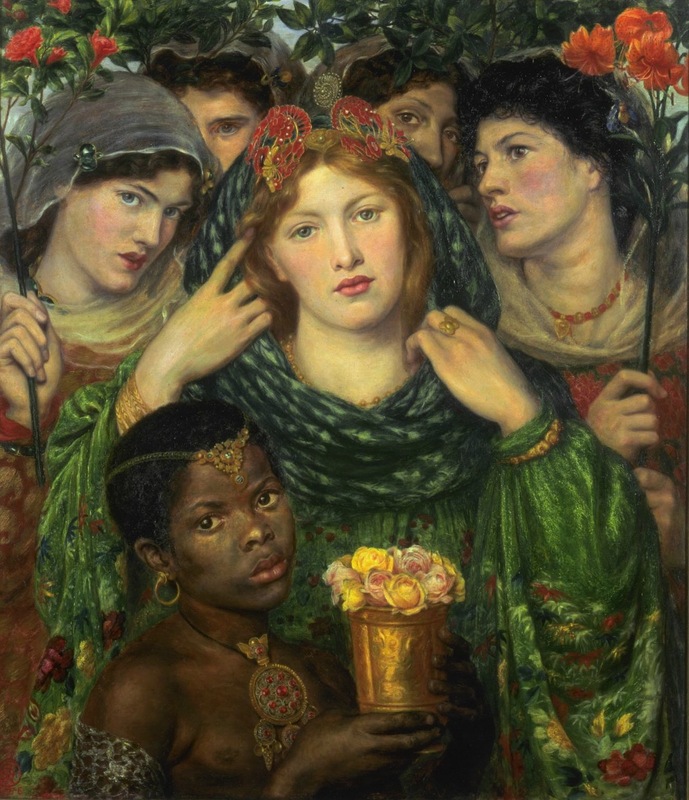 The relationship between Cameron’s female portraits and Dante Gabriel Rossetti’s opulent paintings of beautiful women in the 1860s has often been noted; she was on familiar terms with the Pre-Raphaelite circle, photographing Holman Hunt and sending prints to Rossetti, who greatly admired them. The Rosebud Garden recalls his The Beloved (below) with its close arrangement of costumed women in floral, foliate surroundings, though it’s difficult to know if Cameron ever saw the painting in person (it was created for private patrons, George and Julia Rae). Also like the Rossetti, the shallow depth of Cameron’s image eliminates any sense of perspective and brings the women forward, very close to the picture plane. By positioning the four Fraser-Tytler sisters with the middle two lower, and alternating between full and profile faces, she lends her composition a beautiful symmetry and a gentle curve which leads the eye in a continual circular rhythm. Dante Gabriel Rossetti, The Beloved (‘The Bride’), 1865-6. Oil on canvas, 82.5 x 76.2 cm. Source: Tate. 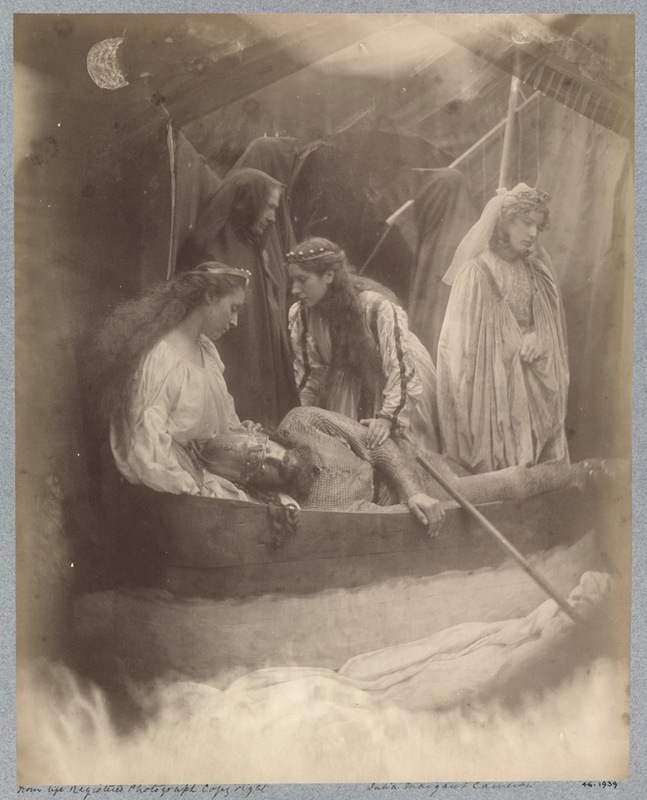 Julia Margaret Cameron, ‘So like a shatter’d Column lay the King’ (The Passing of Arthur), 1875. Albumen print, 34 x 27 cm. Source: © Victoria and Albert Museum, London. So like a shatter’d column lay the King. 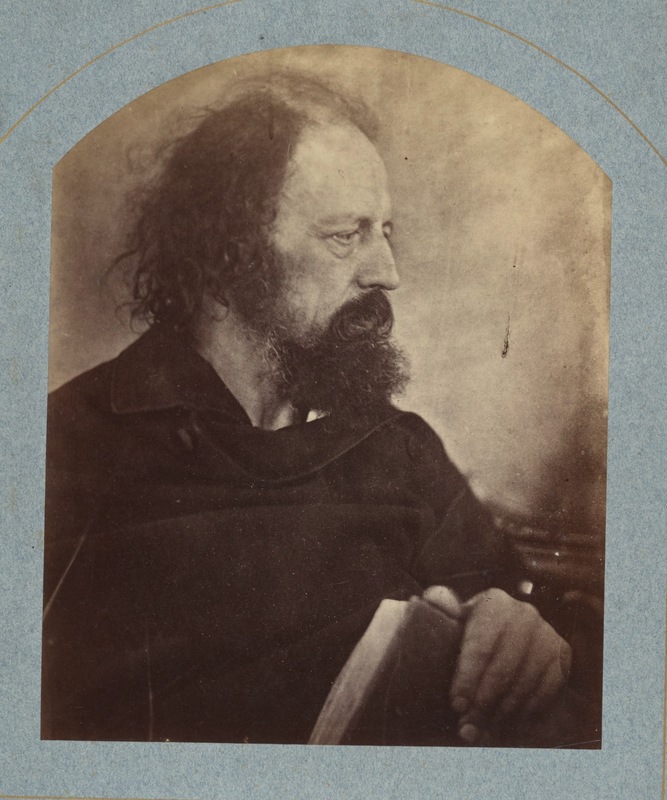 For the frontispiece of Illustrations by Julia Margaret Cameron of Alfred Tennyson’s Idylls of the King and Other Poems (1875), Cameron used her evocative portrait of the poet taken in 1865, famously nicknamed ‘the Dirty Monk’ by him and one of only two pictures of himself he liked (below). 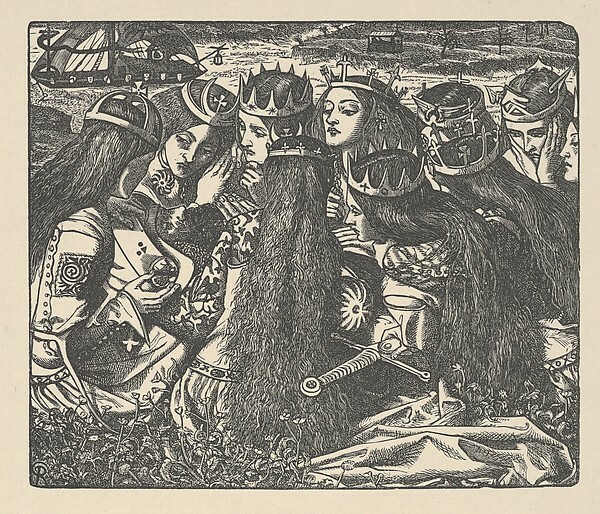 Dalziel Brothers after Dante Gabriel Rossetti, ‘King Arthur and the Weeping Queens’ from ‘The Palace of Art’. Engraving first published in the Moxon Tennyson in 1857. Source: Met Museum, NY. Julia Margaret Cameron, Alfred Lord Tennyson (‘The Dirty Monk’), 1865. Albumen print, 22.9 x 18.5 cm. Source: Met Museum, NY. The gift [of her first camera] I received from those I loved so tenderly added more and more impulse to my deeply seated love of the beautiful, and from the first moment I handled my lens with a tender ardour, and it has become to be as a living thing, with voice and memory and creative vigour. […] I longed to arrest all beauty that came before me, and at length the longing has been satisfied. […] When focussing and coming to something which, to my eye, was very beautiful, I stopped there instead of screwing on the lens to the more definite focus which all other photographers insist upon. The full text of Annals of My Glass House, as reprinted in Illuminations: Women Writing on Photography from the 1850s to the Present (1996), can be read in full on Google Books here. An informative mini-site on Cameron’s life and work can be found on the V&A website. The very kind people at Getty Publications have made the complete catalogue of her photographs, first published in print in 2002, available free online, readable or downloadable. It contains illuminating essays on thematic and technical aspects of Cameron’s oeuvre before the fully illustrated catalogue. Throwback to a previous post, Virginia Woolf and the Victorian Art World, which features Cameron’s iconic photographs of Woolf’s mother Julia Jackson.